There's been an incredible YouTube video doing the rounds. It shows Nottingham physicist Tony Padilla "proving" that the infinite sum 1 + 2 + 3 + 4 + ... results in -1/12. Your Maths Masters were convinced it was the silliest thing they'd seen all year. Then came the New York Times article. Written by science journalist Dennis Overbye, and including extensive quotes from Berkeley mathematician Edward Frenkel, the article seemed to confirm that the sum is indeed -1/12. In particular, Overbye noted that mathematical superstar Leonhard Euler had arrived at the same conclusion. In the face of such evidence your Maths Masters were forced to revise their opinion. They now believe that the Times article is the silliest thing they've seen all year. Well, no, not really. Overbye tries hard to make clear what's going on and the essential truths are there; Frenkel is a very good mathematician and he knows exactly what he is talking about. However parts of Overbye's article are tangled, making it difficult to distinguish the truths from the half-truths. So what is going on? How could someone even contemplate that an infinite sum of positive numbers totals to a negative? And if the brilliant Euler supposedly proved it, who are the (in name only) Maths Masters to claim otherwise? 1 + 2 + 3 + ... does NOT equal -1/12. It simply does not. Infinity can do some crazy, magical things, but it's never that magical. The only possible result of summing all the natural numbers is infinity. Or, if we're not happy with that answer, we simply declare the sum is "too large" to total to anything. Nonetheless, something is going on. Euler was (to say the least) no fool, and the "answer" of -1/12 is not arbitrary. It turns out there is a sense in which -1/12 is genuinely hidden inside that sum. which suggests that the total is 1. Taking the average of 0 and 1 gives Padilla his answer of 1/2. 1 - 1 + 1 - 1 + ... does NOT equal 1/2. It simply does not. The first grouping demonstrates that the only possible answer is 0 and, similarly, the second grouping insists upon 1 as the answer. Each "answer" rules out the other, meaning we have no choice but to give up and declare that Grandi's series has no overall sum. Now, let's choose x = -1, which is in essence what Grandi did in 1703. The left side gives us Grandi's series, and a simple calculation shows that the right side is 1/2. Uh oh. Does this mean Padilla was correct? Emphatically, no! The trouble is, our formula for the geometric sum only works if x lies between -1 and 1, and -1 and 1 are specifically not permitted. *) The geometric sum totals to 1/(1-x) for x between (but not including) -1 and 1. *) The expression 1/(1-x) continues to makes sense for x = -1 (and for any x other than x = 1). That's about it. The essence of "summing" 1 + 2 + 3 + ... is similar, to use analytic continuation to consider a more general expression. (For that sum the continuation process involves the famous Riemann zeta function.) It is this general expression, not the original sum, that spits out the value -1/12. End of story. Except, that it isn't the end of the story. There's something much deeper going on. In 1739 Euler calculated that 1 - 2 + 3 - 4 + ... totals to 1/4, and in 1749 he went to town calculating such crazy sums; the apparent consequence that 1 + 2 + 3 + ... results in -1/12 is hidden in his equations. Euler didn't think of what he was doing as analytic continuation (which was only fully understood a century later); rather he simply assumed that his crazy sums made sense, and then manipulated them just as he would ordinary, everyday sums. Tony Padilla's calculation in the YouTube video is in the same style but much simpler. Euler knew perfectly well he was breaking the normal rules. His purpose was to see what he could discover by breaking those rules. The answer was, tons. Euler's misbehaviour produced a wealth of stunning, undeniably correct mathematics. It's not just Euler. 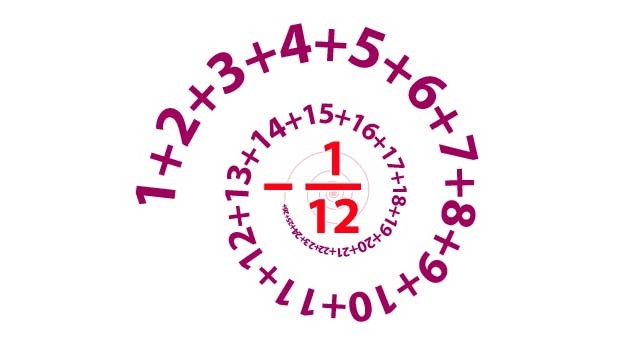 There are all sorts of ways to somehow try to make sense of the sum 1 + 2 + 3 + ... . And, other than simply adding up and getting infinity, they pretty much all lead to the miraculous value of -1/12. What to make of all this? The first and fundamental fact is, beautiful and creative methods notwithstanding, summing 1 + 2 + 3 + ... does not result in -1/12. The YouTube video declares falsely that it is, and plays fast and loose getting there, which is really, really annoying. (A follow-up video and webpage are better, but not nearly better enough.) And, for the Times article to not make crystal clear the falsity of the video's claim is pretty, pretty annoying. But was it good or bad that the YouTube video appeared? Well over a million people have viewed it so far, all of whom have at least seen a glimpse of something truly amazing, and many of whom would have been inspired to look further and to think of mathematics differently. On the other hand, well over a million people now have the impression that the sum of the natural numbers is negative; that's not a positive. On balance, your Maths Masters think the video perhaps had a good effect, though it makes us uncomfortable to say so. Edward Frenkel is much more positive about the whole business, as he makes clear in this video, and in generously long and thoughtful emails to your Maths Masters. Frenkel's point of view is that the result of 1 + 2 + 3 + ... depends on the context; in the more familiar context this sum is definitely infinite; however there are other, rich contexts in which the result is -1/12. (He argues that the question is similar to whether or not -1 has a square root; in the context of ordinary everyday numbers it doesn't, but that all changes when we broaden our world to include complex numbers.) Frenkel also suggests that the whole debate would be clearer and less heated if the expression "regularised sum" were used for these other-worldly contexts. Frenkel is very complimentary of the Times article and, though somewhat critical of the YouTube video, he definitely thinks it's had a very positive effect. For Frenkel, the video's shortcuts and mistakes are much less important than that it resulted in so many people thinking about mathematics. He also approves of the video's overarching message and the capturing of the spirit of Euler's work: mathematics is about taking risks, and it can have a sense of "magic". We respect Edward Frenkel and we like him. Not only is he an excellent mathematician, he is more eccentric than your Maths Masters, and he causes more trouble than your Maths Masters. Really. We hope to write about Edward in a future column. We'd also be very happy if he could convince the fast-and-free physicists to adopt the expression "regularised sum", and to leave "sum" to mean what it means. However, we still think Frenkel is underselling what it means to sum. (We just don't buy his complex numbers analogy.) And, we think Frenkel is somewhat overselling the role of magic in popularising mathematics. Magic tends to be presented in one of three styles; first, there's the Uri Geller style, with the foolish pretence that the magic is real; then there's David Copperfield, where everyone knows it's trickery, but it's great trickery; finally, there's Penn and Teller, with plenty of great tricks but also plenty of fun and humour in exposing the tricks. For us, the YouTube video is just way too much Uri Geller. The Times article is better, more David Copperfield, but still with a disappointing Uri element. What's the best way to demonstrate the magical nature of mathematics? Your Maths Masters are firmly convinced that Penn and Teller is the way to go.